Thanks to S/Sgt Raymond Algueseva (L Gunner). Crew #3911 in front of Aircraft #38 "Forever Amber II". For extraordinary achievement while participating in aerial flight on 25-26 May 1945 on an incendiary bombing mission against the urban and industrial area of Tokyo, Japan from a base in the Marianas Islands. These individuals were combat crew members of a B-29 aircraft acting as pathfinder, with the task of lighting up the target area for the main force of planes which was to follow. Although they were caught and held in a cone of searchlights all the way in on the approach and over the objective, and though they sustained hits from intense anti-aircraft fire, making their plane easy prey for attacking fighters, this crew dropped their bombs accurately, successfully locating and lighting the target area. By vigorous and successful evasive action, they withdrew for the return to home base. Although suffering extensive battle damage, including several controls shot out, these veterans of more than twenty-one combat missions successfully performed their assigned mission with coolness, courage and skill. They contributed materially to the accomplishment of a severe blow against the enemy, thereby reflecting great credit on themselves and the Army Air Forces. 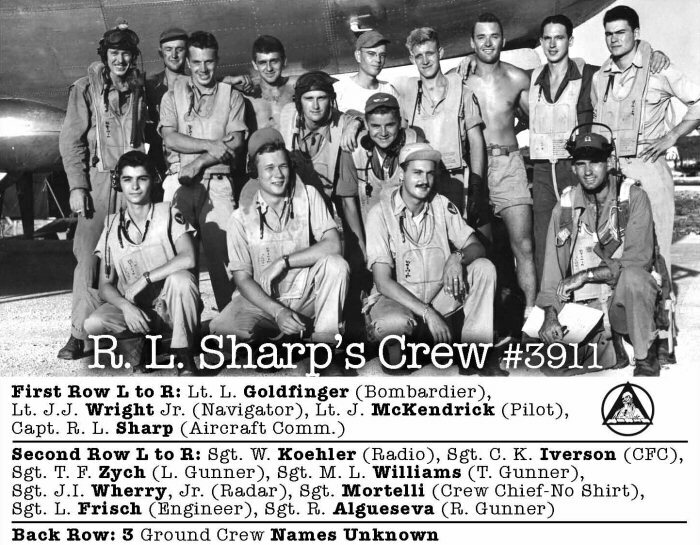 A separate DFC Citation was prepared for Captain RICHARD L. SHARP, Aircraft Commander of the above aircraft. Starting sometime after June 5, this crew generally flew "Forever Amber II".